This is an indoor use only item. Installation and support will take some effort. it is designed to hang from a cable. Subject to additional shipping charges. May be drop shipped depending on the destination city. If it is not in stock, please inquire. We normally do not keep this large item in stock but are happy to special order it for you. 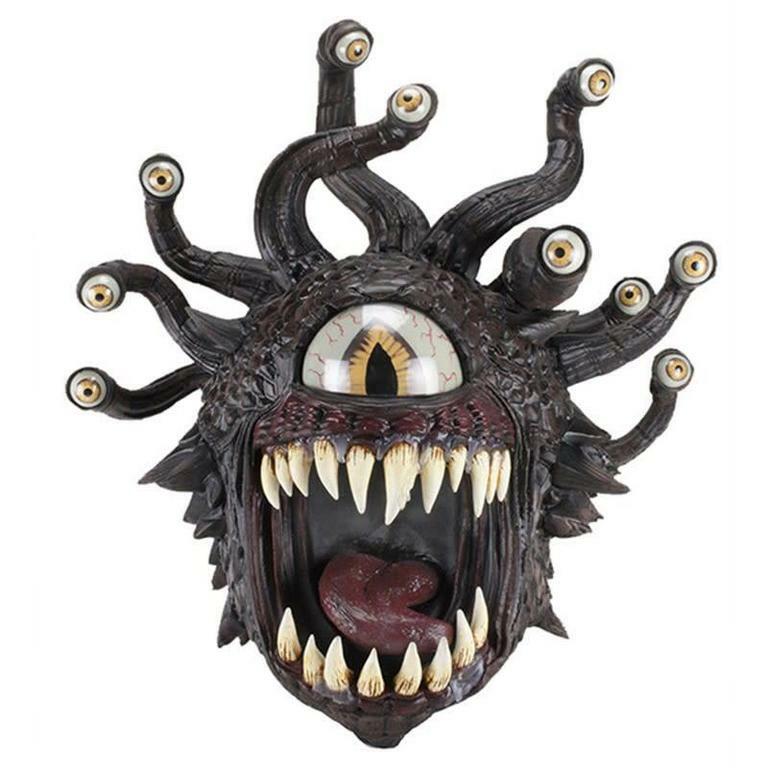 Decorate your game room or living room with this stunning recreation of the Dungeons & Dragons Beholder! The Dungeons & Dragons Beholder Trophy is made of foam rubber and latex that’s carefully hand-painted for realistic detail. It also features spectacular “glass-like” eyes for stunning realism. Nothing can escape its gaze! The Beholder Trophy is designed with an integrated multi-point hard point system which allows you to hang the figure from the ceiling (secured to a truss or structural element). A hard point eyelet at top enables the figure to hang level looking straight ahead. A second eyelet positioned further back on head allows for hanging higher with a downward glance towards the Beholder’s prey. For retailers with HVAC, we’ve included hard point eyelets on the bottom of figure for additional securing to prevent swinging or torquing that could play havoc with security systems. *Note: Mounting hardware not included. Professional installation required. - If you do not understand the instructions or have any concerns or questions, please contact a qualified local professional installer. - Do not install or assemble if the product or hardware is damaged or missing, if you require replacement parts, please contact your local retailer for assistance. - This product has been designed for hanging with appropriate cording from a wood ceiling joist or comparably strong infrastructure. Do not use this product for any other application than originally designed. - WizKids will bear no responsibility for mounting to the ceiling, or incidental or consequential damages arising thereof. - WizKids disclaims any liability for the improper modifications, installation, or use. - The manufacturer will not be liable for any damages arising out of the use of, inability to use, the product.